There’s lots to discover in Kungsbacka, whether you want a relaxing beach holiday or an activity-packed time. Visit one of Kungsbacka’s 17 nature reserves ranging from heather-covered moors to coastal heaths and translucent beech forests. The coast offers a choice of child-friendly, soft sandy beaches or bare rocks. Are you a golfer? In Kungsbacka the golf season lasts almost all year. There are seven golf clubs and 13 golf courses, from 3 to 20 minutes’ drive from the town centre. Tjolöholm Castle is Sweden’s leading Art and Crafts property. The castle was built between 1898 and 1904, and is a mixture of 16th century English architecture combined with all the modern comforts from the turn of the century. 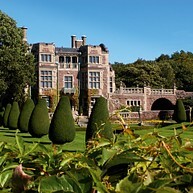 Surrounding the castle is a formal garden, which slowly transforms into natural English style parkland. The estate is situated on it's own peninsular, and numerous footpaths lead through oak forests and coastal landscapes. Public tours take place every day during the summer season, and every weekend the rest of the year. Visitors are shown round many of the castle’s 36 rooms. Group tours, in Swedish, English, German or French can be booked year round. 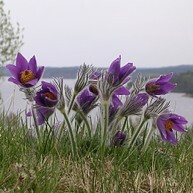 There is a great view from the top of the ridge, with the sea to the west and Lygnern, Halland’s largest lake, to the east. 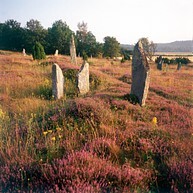 Fjärås Bräcka has a large iron age grave field with around 100 menhirs, and a nature information centre with a café and information on the ridge’s history. A genuine 19th century village with 17th and 18th century roots. Apart from the car park, you won’t see much that is modern. Join a tour of the village, explore the country lanes or stroll along paths of Hallandsleden. The café serves home-baked cakes and waffles. On Tölöberg hill in central Kungsbacka is the city’s first water tower, built in 1897. 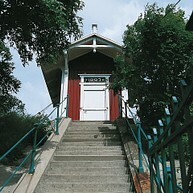 Climb the 179 steps for a panoramic view of Kungsbacka. Kungsmässan is a modern shopping centre with about 90 shops and eating places. Sweden’s oldest remaining double lighthouse is four nautical miles northwest of the Onsala peninsula. You can spend the night at the youth hostel and learn about the fascinating maritime history of the area, with the sea and countryside on your doorstep. In Kungsbacka the golf season lasts almost all year. There are seven golf clubs and 13 golf courses, from 3 to 20 minutes’ drive from the town centre. Visit one of Kungsbacka’s 17 nature reserves ranging from heather-covered moors to coastal heaths and translucent beech forests.